... a cross between Narnia and Pan's Labyrinth. I've loved Beck Sian's music from the very beginning but this moves things to another level. The inspired move from guitar to keyboards adds volumes to the mystery and the well crafted lyrics and haunting vocals makes this album a real joy to listen to. For me, the stand out track is the icily atmospheric "The Frost" and the catchy little ringing hook from "When the Snow is on the Ground" will linger in the mind long after the first hearing. Anyone familiar with Beck Sian will love this but I'd strongly recommend anyone who loves beautiful music. I really love this CD so well crafted in every aspect. Beautifully put together package. Love the artwork and pictures. The wonderful vocals superbly sung along with subtle and atmospheric, enchanting music. So well produced. A masterpiece. I listened enthralled several times in a row. I'm giving out several copies to my really good friends only. including members of the Shropshire band Whalebone who fill out the sound. Beck Sian’s classic folk noir deserves a wider hearing. Beautifully produced and mastered by the Terrascope’s Steve Palmer, this album is an enchanting and dream-coated affair that is warm and ethereal, displaying a languid and mystical ambience throughout. Opening with the soft spoken delights of “Wycoller Hall”, the first thing you notice is the haunting and beautiful voice of Beck Sian, crystal tones gliding over the musical backdrop, reminding me (and everyone else) of Clannad. Next up “The Black Silk Handkerchief” is a traditional tale of love, parental interference, ghosts and death, here given a sheen of 70's acid folk, the droning backing the perfect foil for the sweet vocal delivery. As the album progresses it reveals a darker heart, the loneliness of the Yorkshire moors, a major influence on the writing, shadows at twilight and unease, with both “The Moon on the 13th” and the title track having a creepier atmosphere, the latter using a gently ringing guitar as its backing. Even more darkness is created on “The Dark Stairs”, a distorted droning guitar adding a harsher sound, building on a ghostly pulse and soft melodies, the song drifting into “The Moors”, another spooky yet serene piece that has bags of atmosphere and an ear for melody, the addition of drums giving the piece plenty of energy. Featuring the poetry and voice of John Carder Bush (Kate's brother), the spoken word of “Lady of the wind” adds another dimension to the collection, the sympathetic violin playing of Raven Bush and vocals of Beck creating a sultry drone over which the words dance. With the words of Henry Longellow and the contribution of folk group Whalebone “The Old Clock on the Stairs” is one of the strongest cuts and also the one which will remind you of Kate Bush, an acknowledged influence and to whom Beck is related, everything coming together in perfection, the wonderful production allowing you to hear everything as it should be. Equally as good, “Top Withens” is a gentle and gorgeous song that paints pictures of gnarled trees, stone walls and wind-dancing crows in your mind, whilst “Tales of a Wayside Inn”, recorded in one take, captures all that is good about Beck Sian, the simplicity and sweetness of the performance shining through delightfully. Finally “The Mirror in the Deserted Hall” is another ghostly tale with a suitable musical ambience created by Chris Gill who added guitar, keyboards to several tracks, the tune again bringing images to mind, aided by the lyrics as well as the chiming bells. 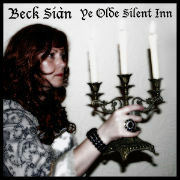 "The third full-length CD from Beck Sian "Ye Olde Silent Inn" will delight and amaze her fans and followers whilst winning her many new ones. Inspired by Beck's visits to that inn, near the village of Stanbury near Haworth in West Yorkshire, the album marks her move into what she terms "haunted and enchanting folk noir" with an enthralling mix of stories and influences - haunted houses, windy moors, spooky moonlit walks, highwaymen, moths, ghostly inns, ruined halls and creaking staircases to name a few. The album sounds darker than her previous works, but there is also perhaps more coherence here in Beck's talent for creating evocative melodies and lyrics which she seamlessly weaves into the soundscapes that form the album. Beck's vocal range and power is showcased and lovers of traditional folk songs will delight in her re-interpretation of "Molly Malone", sung unaccompanied amongst distant ghostly echoes of church bells, street traders and horses. "Down in Yon Forest" will particularly delight fans of Beck's first album "Unfurling" with its ghostly cries from the ruined hall in the woods. However, Beck has also gained a reputation for experimentation. In "Top Withens", one of her few instrumentals, Beck uses her voice as an instrument in itself to depict the howling winds on the moors. These techniques are also used to great effect on "Lady Of The Wind", a poem written and narrated by John Carder Bush and set to Beck's music. The track also features his son Raven Bush, who contributes beautifully sensitive violin motifs. One of the most atmospheric songs on the album is "The Moon On The 13th", remarkably improvised during an otherwise unproductive session with co-producer and engineer Steve Palmer. Once again, Chris Gill makes stunning instrumental contributions on four songs, most notably in the opening bars of "The Moors" - perfectly capturing the spirit of the countryside around Haworth and the Plas Teg inspired "The Dark Stairs". These tracks are the perhaps the most rock-inspired songs Beck has recorded to date - in interviews she has cited the influence of heavy metal bands from her childhood. Whalebone make a hypnotic, mesmerising contribution to "The Old Clock On The Stairs" with their unique blend of guitar and fiddle and together with "Tales Of A Wayside Inn" are perhaps the most catchy songs on the album. Beck writes in a very visual way. I have had lots of fun in forming my own mental images from the songs and the album well rewards repeated listening. This is an album from the heart and one to treasure". The second CD from Beck Sian, I came across this album as a fan of Kate Bush (to whom Beck is related), but this album grabbed hold of me almost from the first listen. She proudly cites Kate’s work as an inspiration (most noticeably for me in the opening words of “In the Greenery”) however Beck’s musical journey is very different having it’s roots in folk music, yet interwoven with a vividly surreal mix of Irish, Welsh, Australian, gothic and world music influences. Luminous Wings & Unseen Things is loosely based on the atmospheres and legends inspired by the various themed gardens of a haunted Welsh castle. The arrangements are sparse, yet form lush tone poems, occasionally complemented by collaborator Chris Gill’s haunting keyboards as in “The Topiary Garden”. Beck has a rare gift for creating evocative and original music, with lyrics often inspired by her own poems and musings as well as texts taken from classical literature. As an independent artist, she follows her own intuition - this is music made with love and care and as such works its way into your soul. One of the most memorable songs is “Thornfield” with its strong imagery of Jane Eyre. Rather than focus on merely telling the story, Beck draws you powerfully into the hearts and minds of the characters and their dilemma: “lighting strikes and splits our tree. The fire rages, tries to take you from me”. She has gained a reputation for her vivid and spine-tingling reinterpretations of traditional folk songs, really getting “under the skin” of the songs, giving them new emotional meaning. In “She Moved Through The Faire” an old familiar supernatural ballad has never sounded so haunting and otherworldly. In “Lavender’s Blue” the strains of the opening tin whistle give way to a beautifully arranged madrigal style keyboard arrangement. In “Siúil a Rúin”, Beck gives this song a dreamlike feel, with the comforting sound of a running stream and birdsong only for accompaniment. “Old Mr Crow” has a delightful almost maverick eccentricity. The song touches on one level with personal change and growth but I love it’s humorous feel. An album to treasure for years to come!!! Unfurling is Beck Sian’s first full length recording, following on from the ideas and themes explored on her Ethereal EP, which is included here as a bonus (worth seeking out in it’s own right, if you can find it, for an extra spine-tingling rendition of “Danny Boy”). Her music defies obvious categorisation but may be loosely described as a blend of folk with strong shoe gaze and world music influences. Unfurling is themed on the environment of an Australian rainforest (Beck was born in Australia of English/Welsh parents), but is remarkably diverse in its influences. She is equally at home adapting traditional music and literature, for example Greensleeves or presenting her remarkable and memorable original poems and songs. Paul Strahan provides sure footed keyboards and arrangements and the innovative use of wind chimes, bullroarers, tropical birdsong recordings and thunderstorm effects create an almost visual light and shade in the musical textures. Given the diverse range of influences from the Irish of Beck's grandmother to her friend Stax's didgeridoo flourishes, the album never sounds disjointed. Her voice has an astonishing range (most apparent on “The Foggy Dew”). A particularly favourite track is a delightfully mellow early version of her classic “Moss” (based on a poem by Alfred Lord Tennyson). The song contains one of her most sparkling blends of music and lyrics: “music that gentler on the spirit lies, than tired eyelids upon tired eyes, music that brings sweet sleep, down from blissful skies”. Beck's voice is especially evocative when unaccompanied - songs such as “The Night Will Never Stay” and “Messages In Dreams” can melt all but the hardest hearts and burn their way into your memory. Pride of place goes to the evocative, dark and ominous sounding “Under Thunderous Skies”, which ends on an unexpectedly positive note representing the sense of positivity after overcoming the fallout from a failed relationship, an experience common to all. This album is timeless and will never sound dated. I hope Beck will continue making new music for a long time to come. "The beautiful and haunting voice of Beck Siàn lulls the listener to another place... a wild, forgotten realm inhabited by faeries and spirits, where raindrops fall upon tangled ferns and ivy... where hidden things dwell! To listen to her songs is like taking a stroll through a secret garden... or a Haunted Forest!" "For virtually all of this disc's 53 minutes the result is charming and intriguing and yes, quite magical. Both earthy and unearthly. Weird even, sure. Charisma aplenty, an amazing singing voice, and a quirkily original writing talent are but three of the common factors, but Beck sounds like no-one else even though there are occasionally theatrical touches in her delivery which definitely remind me of Kate Bush. As well as possessing an amazing voice, Beck's a multi-talented musician, on this CD playing guitar, tenor recorder and Celtic harp. As a general observation, Beck's music - and her writing - is marked by a quite special quality of tactile sensuality in the way that she uses her chosen images and sounds; she also has a natural ear for creative instrumentation in her settings, for the most part eschewing the obvious effects and going instead for innovative colours that genuinely enhance the words. My favourite pieces here are those where all these expressive virtues come together in a unified attempt at conveying a special experience or mood or quality of atmosphere: the extraordinarily powerful 'Under Thunderous Skies', also 'Moss', 'Tangled In Green', 'Mountain Ash' and the two brief a capella tracks. Beck's music is seriously enchanting; she clearly has a very special talent. Generally speaking, Beck's music isn't really like anything else you will have heard." Beck Sian is a relation to Kate Bush which hardly comes as any surprise if you hear her music. She has an ethereal voice and the Celtic influences are present and correct. She writes her own material and adapts traditional folk songs. She’s clearly her own woman and as a listening experience this album is hard to beat. Moss sees the voice reach high, pure notes and the music sweeping along nicely. Greensleeves is familiar territory, but this version fits into Sian’s mystical soundworld. Her vocals are like something out of a dream. Under Thunderous Skies sees Sian take a song of her own that’s quite lovely and strum her guitar wonderfully. The Foggy Dew another traditional song, gets a nicely atmospheric reading. The use of a didgeridoo elsewhere spices up the album’s sound and gives it a unique flair. Beck Sian’s Unfurling is an album to treasure. "Haunted Forest Music Wins Over Audience"
"Saturday night saw the sensational Beck Siàn give her first performance at The Keay, St. Austell. The scene was set with candle-lit tables providing the perfect setting for the evening ahead. The stage was decorated, with the microphone dressed in Autumnal roses. Beck walked on stage as if she had been doing it all her life. She has a tremendous stage presence and began by talking a bit about her background. This was carried on throughout the evening between songs. She has a unique voice, amazingly with no prior singing tuition, a talent for story-telling and is a multi-talented musician."